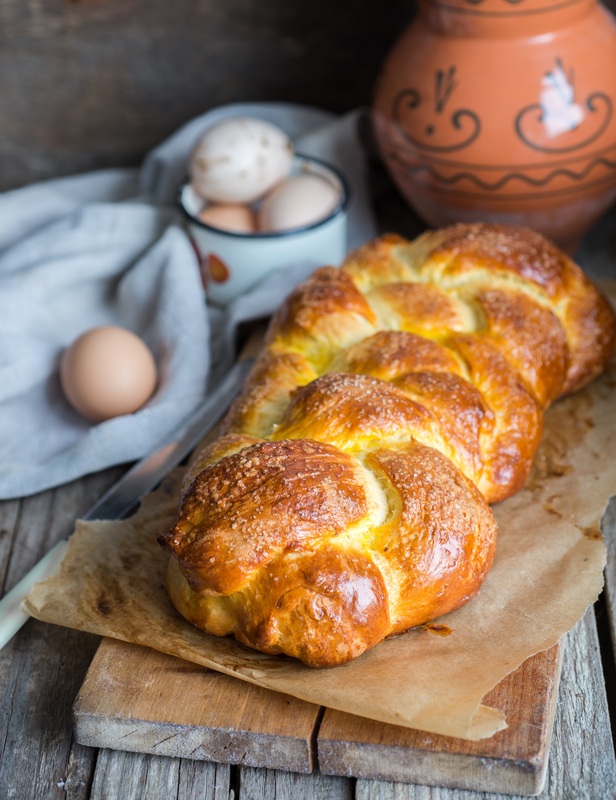 Beautiful Challah bread, perfect for Shabbat, or any special occasion. Add the sugar, honey, salt, and water. After all the ingredients have dissolved, add the milk. Heat until all is fairly warm, no more than 110*F.
Add the flour, eggs, and yeast. Mix for about 8 minutes on low. FIRST AND SECOND RISES Transfer dough to buttered bowl. (I use non-stick cooking spray.) Cover bowl with plastic wrap and hand towel. Let rise 1 to 1 1/2 hours, or until doubled. Deflate, cover as before and let rise 45 min.-1 hr. SHAPING AND FINAL RISE Spray 2 baking sheets with cooking spray. Divide each half into 3 equal pieces. Roll each piece into about 18" pieces. Braid, just as you would for a hair braid. I start at the middle to the end, then turn around and go from the middle to the other end. Place each on baking sheet and cover with towel. Let rise 40 min. Preheat oven to 375*. Just before baking, I usually brush the dough with an egg wash.
Just take an egg, stir well with a fork, then brush on braided dough. This step is not necessary, but gives the bread a lovely, glossy sheen, and the crust a better texture. Bake for 20-30 minutes, depending on how you like your bread. My family likes ours ever-so-slightly doughy on the inside, so I bake it for the lesser time. If needed, cover the bread with foil, shiny side up, about halfway through cooking, so the crust doesn't get overcooked. We usually break off pieces by hand, but it can be sliced, also. Share second loaf with another family or friend, or slice it and use it for the best French Toast you'll ever taste..